This week, I’ve been over in Jersey helping a school with their educational technology. In particular, I’ve been doing some training on G-Suite for Education (as Google now call what used to be ‘Google Apps’). The main focus has been Google Classroom but, as this is basically a front-end for the rest of G-Suite, we spilled out into other areas. I first used G-Suite for Education back when I was a classroom teacher. We didn’t have it rolled out across the school but, back then, and in the school I was in, I was left to just get on with it. So I can remember being administrator, sorting out student accounts, forgotten passwords, and the like. The thing that impressed me, though, was the level of collaboration it encouraged and engendered. Then, when I became Director of E-Learning of a new 3,000 student, nine site Academy in 2010, I rolled out G-Suite for Education for all 500 members of staff. It worked like a dream, especially given some of the friction there was harmonising different MIS and VLE configurations. The thing that I valued most back then was the ability to instantly communicate between sites by using a tool which has now morphed into ‘Hangouts’. At that time, I was a bit of a pioneer in the use of Google’s educational tools, which is why Tom Barrett and I, along with some others in our network, were ‘Lead Learners’ at the first UK Google Teacher Academy. That’s grown and grown in the intervening period, while I’ve been working in Higher Education, at Mozilla, and consulting. Fast forward to the present, and we’re in a very different educational technology landscape. Where once there seemed to be new, exciting services popping up every week, the post-2008 economic crash landscape is dominated by large shiny silos. The dominant players are Google, Microsoft, and Apple — although the latter’s offering seems less all-encompassing than the other two. I have to say that I’m a bit biased in favour of Google’s tools. I’m not a big fan of their business model, although that’s a moot point in education given that students and staff don’t see adverts. It’s a much more ‘webby’ experience than other platforms I’ve used. The more I get back into using G-Suite for Education the more I appreciate that Google doesn’t prescribe a certain pedagogy. The approach seems to be that, while particular apps like Classroom allow you to do some things in a certain way, there’s always other ways of achieving the same result. It’s also extensible: there’s loads of apps that you can add via the Marketplace. OK, so that’s all very well and good, but what has that got to do with you, dear reader? Why should you care about my experiences and views on Google’s education offerings? Well, a couple of things, I suppose. First, in relation to my 7 approaches to educational technology integration post, I feel like there’s some really easy ways to move staff up the SAMR model towards the ‘transformational’ type of technology use we want to see. One thing I’ve been focusing on recently, is explaining the mental models behind technologies. In other words, rather than telling people where to click, I’m explaining the concepts behind what it is there doing, as well as situations in which it might be helpful. How they teach is up to them; I’m providing them with skillsets and mindsets to give them more options. Second, I feel like there’s a huge opportunity to integrate Open Badges with G-Suite for Education. It seems pretty straightforward to build upon Google’s platform to provide the email addresses of who should be issued a badge, as well as the environment in which badge issuing would be triggered. I’m thinking through a badging system for one of my clients at the moment, built upon the usual things I emphasise: non-linear pathways, individual choice, and an element of surprise. In that regard, I’m planning on starting with something like a ‘Classroom Convert’ badge that recognises that staff are developing mindsets around the use of Google Classroom, as well as skillsets. There are, of course, ways in which staff can go ‘full Google’ and become (as I am) a Google Certified Teacher, and so on. That’s not what this is. My aim in any badge system is to encourage particular types of knowledge, skills, and behaviours. Whatever system I come up with will be co-designed and go beyond just the use of G-Suite for Education. As the TPACK model emphasises, the system will have a more holistic focus: integrating the technological, pedagogical, and content knowledge required for purposeful educational technology integration. Ideally, I’d like an approach where students can use something like Unhosted apps to bring their own data store to the applications they choose to use when collaborating with their teachers and fellow students. I’d like to see them have a domain of their own, and learn enough code to have real agency in online digital spaces. While I’ve got that in mind, I’m also a pragmatist. 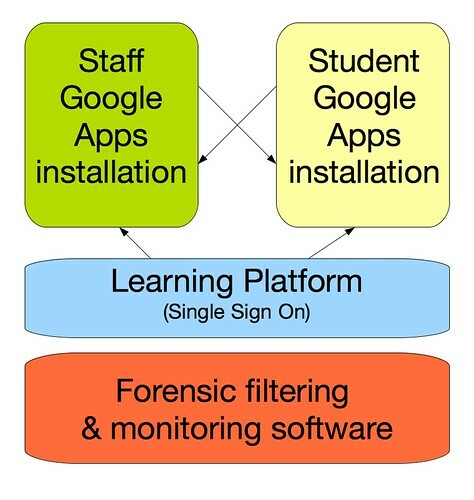 The tools Google provides through G-Suite for Education, while not world-changing, do move the Overton Window in terms of what’s possible in technology integration. Even just working collaboratively on a single Google Doc is pretty mindblowing to people who haven’t done this before. I wasn’t going to publicly-promote this until later, but Nick Dennis and I have set up a blog about mobile technologies in education over at http://mobilizingeducation.tumblr.com. The URL (and indeed the name of the blog) may change but we felt that there wasn’t enough that blended pedagogy and practice in this area. We bought Ben an Apple eMac for his 3rd birthday in January. He loves using it, but as he’s progressed to more complex games and activities, it’s become a bit too much for the machine. In fact, one Flash-based video he tried to wach recently was reduced to a slideshow! I’m wondering whether his next ‘computer’ should in fact be a tablet of some description or whether, given that schools are likely to stay with traditional computers in the near future, that would put him at a disadvantage? I’m currently sorting out Google Apps Education Edition for internal communication and collaboration at work. Things have changed a bit since I set it up at the Academy last year: there’s a new admin interface and (most importantly) Google Apps Marketplace, amongst other things. Google Apps Marketplace allows third-parties to integrate their products and services – usually by single sign-on – with Google Apps. Some are paid-for, some free and all have separate terms and conditions to the core Google Apps offering. Today I’m presenting on the benefits of Google Apps as a collaborative platform for people who work together often, but aren’t physically co-located. It’s not easy to separate fact from myth when comparing Microsoft’s hosted services (e.g. [email protected], Office Live) with Google Apps. You don’t necessarily want to do the same things with Google Apps. You can use Outlook to connect to Google Apps anyway. Whilst Microsoft’s offerings allow near real-time collaboration with Excel and OneNote, pages are locked for editing if someone else is using a Word document or PowerPoint presentation. By way of comparison, you can collaborate and edit all of Google Docs’ offerings in real-time. In terms of real-time collaboration, Google wins hands-down, because Office offers none. Google’s Docs offerings have been on the market a good four years now, so they’ve had more time to learn what users want and need in an online suite. It shows in the design and function of Docs for day-to-day users. I toyed with the idea of producing a point-by-point checklist here to compare Microsoft and Google’s offerings, but I don’t really think there’s any need. It’s a question of attitude and focus. For example, Microsoft drags its heels insisting on Silverlight installation whilst Google looks to the future with HTML5, an emerging web standard. So, if you always use the same device, deal in only Microsoft-produced documents and are convinced Outlook is God’s gift to email users, then you’ll love [email protected] and Office Live. But if, on the other hand, you like to be able to get various kinds of documents in and out of your systems easily, if you need to collaborate (in real-time) with colleagues not physically co-located, and if you want to be able to access everything on whatever device and browser you prefer using, then you’ll love Google Apps. Never lose a document again: how Google Docs can change the way you and your department work! Instead of attaching documents to emails, why don’t we attach email addresses to documents? That way, everyone sees each update of a document (e.g. a scheme of work) and there is a central repository for departmental or school files. Sign up for an account. Follow the instructions using your school email address. Login to the Ridgewood Google Apps dashboard using the username/password set up in Step 1. You might want to bookmark this login page for ease-of-access next time! In the dashboard area you have several options, the rest of which you can explore at your leisure. For the moment we’re interested in Docs, so click on that! You can view the ‘revision history’ of the document by going to Tools/Revision history in the editing window. This shows every change that has been made to the document. You can revert to any previous incarnation of a document if necessary! Want to be able to provide staff/pupils with more than 10MB webspace? GMail offers over 6GB! Want students to be able to start work at school and finish off at home? Try Google Docs! Want departments to be able to quickly and easily create websites? Use Google Pages or Google Sites! That evening I started putting together a proposal. As usual, I tweeted about what I was up to. A few kindly folks – namely Tom Barrett, Dave Stacey, Damian Bariexca, Kevin Jarrett, Miguel Guhlin, Paul Williams and Daniel Stucke were kind enough to give me feedback and suggestions.